Fill in your details below and we will let you know within 24 hours if we can get Stephenson's Rocket to you with haste! Grail Games presents an all-new edition of this classic game, designed by the celebrated Reiner Knizia, and illustrated by fan-fave artist, Ian O’Toole! In Stephenson’s Rocket, players take on the role of rail barons in 1830s England. By investing in the various new rail lines, transporting passengers, and building up the local industries, players will vie for the honor of becoming the most prestigious rail baron in the early days of the steam locomotive. Stephenson's Rocket does many things within its tight, intriguing rules set: it is a tile-laying game, a route-building game, a set-collection game, and a bidding game - all in one. 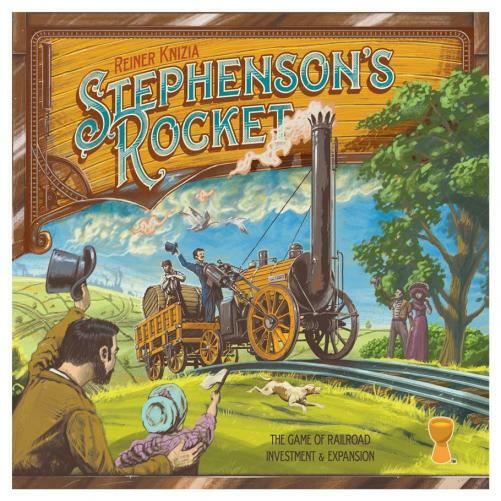 The game can be expanded with the Stephenson’s Rocket: Eastern USA & China game board, also available from Grail Games.